Sania Mirza of India hits a forehand while playing against Nadia Petrova of Russia. CARLSBAD, Calif. (AP) -- Unseeded Sania Mirza of India stunned No. 4 Nadia Petrova 6-2, 6-1 Wednesday at the Acura Classic, which has lost two of its top three players in two days from an already-depleted field. Mirza, ranked 59th in the world, had a surprisingly easy time with the ninth-ranked Petrova in the second-round match. She joins Shuai Peng of China and Mashona Washington as unseeded players who knocked off highly ranked Russians early in the $1.3 million tournament. Peng was a 7-5, 6-4 winner Tuesday over Elena Dementieva, seeded third and ranked sixth. Washington defeated No. 8 Vera Zvonareva 6-4, 4-6, 6-4. With Lisa Raymond losing earlier in the day, Washington is the only remaining American in the field. Four Russian players advanced to the third round from the original 11 who entered the event. The tournament has lost three of its top four seeds, including No. 1 Lindsay Davenport, who withdrew Sunday with an injury. Earlier injury pullouts were second-ranked Maria Sharapova, French Open champion and fifth-ranked Justine Henin-Hardenne, and No. 7 Serena Williams. Mirza, who started the season ranked No. 169, had to win three matches in the qualifying tournament to get into the main draw. 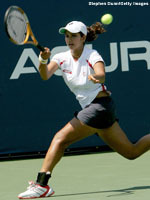 In January, Mirza became the first Indian to take a WTA Tour title when she won in her country at Hyderabad. With Petrova and Dementieva exiting early, the tournament has just two of the top-10-ranked players remaining _ No. 4 Svetlana Kuznetsova and Clijsters. Sixth-seeded Mary Pierce of France breezed through to the third round with a 6-1, 6-1 victory over Anna-Lena Groenefeld. Pierce, the French Open runner-up, had little trouble dispatching the German in her opening match after receiving a first-round bye. A number of seeded players were pushed to three sets before finally winning, including No. 5 Patty Schnyder of Switzerland. Schnyder was a 6-4, 6-7 (2), 6-1 winner over Kveta Peschke of the Czech Republic. Ai Sugiyama of Japan defeated No. 14 Daniela Hantuchova of Slovakia 7-5, 4-6, 6-2.